In 1993, Digital Theater Systems debuted its new 6-channel digital playback system in movie theaters worldwide with the release of Steven Spielberg's Jurassic Park. In the years since, blockbusters and award-winning films such as Braveheart, Apollo 13, Twister, Independence Day, Lost World: Jurassic Park and Con-Air have all utilized the DTS sound system. 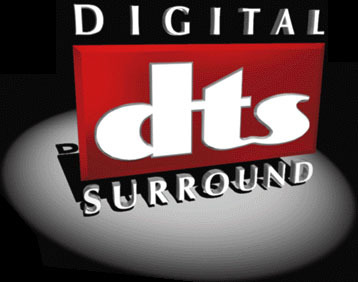 Now DTS Technology is bringing DTS Digital Surround to your home theater. Up to 5.1 channels of 20-bit audio (five full-range channels plus a subwoofer channel) are encoded on the digital tracks of a DTS laserdisc. The analog tracks contain the standard stereo surround soundtrack, or other special programming such as an audio commentary. A standard LaserDisc player with digital audio output is required to access the DTS soundtrack from a LaserDisc. DTS Encoded CDs completely replace the standard audio track with the DTS bitstream. For CD and LD playback, a standard player with Digital Audio outputs is all that is required. A DTS decoder (either stand-alone or integrated into an A/V receiver) is also required. Presented here is a complete listing of all titles issued on LaserDisc and CD which utilize a DTS Digital Surround soundtrack. The region for each title and release date is also listed. To navigate through the titles in each format, click on the graphic name of the desired format above. You can also click on the "DTS Logo" in the lower left corner to toggle between CD and LD format views. Due to the intense graphic nature of this page, it has been divided into multiple parts. Simply click a letter to see all titles which begin with that letter.